SEOUL, South Korea (AP) — The top U.S. envoy for North Korea returned from three days of talks in Pyongyang and will meet again with his North Korean counterpart before the second summit between President Donald Trump and North Korean leader Kim Jong Un in Hanoi later this month, the U.S. State Department said. 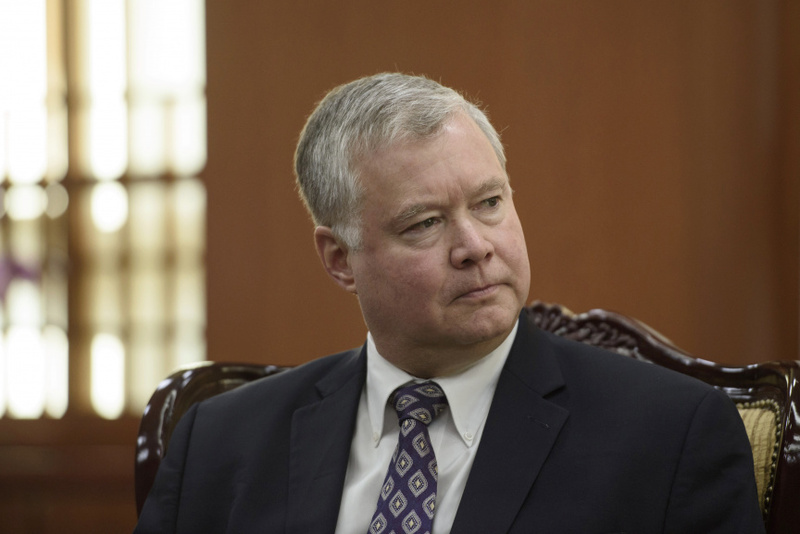 Stephen Biegun, the U.S. special representative for North Korea, met with South Korean Foreign Minister Kang Kyung-wha and Seoul's chief nuclear envoy Lee Do-hoon on Saturday to brief them on his negotiations with North Korea. "Our discussions were productive," Biegun said while meeting Kang. "President is very much looking forward to taking next steps. We have some hard work to do with DPRK between now and then. I am confident if both sides stay committed we can make real progress here," he said, referring to North Korea by its formal name, the Democratic People's Republic of Korea. In Pyongyang, Biegun and Kim Hyok Chol, North Korea's special representative for U.S. affairs, discussed "advancing Trump and Kim's Singapore summit commitments of complete denuclearization, transforming U.S.-DPRK relations, and building a lasting peace on the Korean Peninsula," the State Department said in a statement. It said that Biegun and Kim agreed to meet again before the leaders' second summit, scheduled for Feb. 27-28 in Hanoi, Vietnam. Trump tweeted the venue on Friday in Washington, saying Biegun had just left North Korea after a "productive meeting" on the summit. Trump added: "I look forward to seeing Chairman Kim & advancing the cause of peace!" The president had previously announced Vietnam as the summit location, but the city hadn't been identified. Biegun is thought to have discussed specific disarmament steps that North Korea could promise at the Vietnam summit and what corresponding measures the United States is willing to take. U.S.-led negotiations aimed at stripping North Korea of its nuclear weapons program has made little headway since the first Kim-Trump summit in Singapore last June, when Kim pledged to work toward the "complete denuclearization" of the Korean Peninsula, without providing a clear timetable or roadmap. Experts say Kim is determined to win relief from U.S.-led sanctions to help revive his country's troubled economy, while Trump, faced with domestic problems such as the Russian investigation, needs foreign policy achievements. If the second summit fails to produce a breakthrough, skepticism about the current nuclear negotiations will grow. Some experts say North Korea is trying to use the negotiations to weaken the sanctions and buy time to perfect its weapons program. Trump also tweeted: "North Korea, under the leadership of Kim Jong Un, will become a great Economic Powerhouse. He may surprise some but he won't surprise me, because I have gotten to know him & fully understand how capable he is. North Korea will become a different kind of Rocket - an Economic one!"